Johann Strauss's most popular operetta, Die Fledermaus, was premiered in 1874. It was his third operetta. His relatively little-known seventh, The Queen's Lace Handkerchief, was first performed on 1 October 1880 at the Theater an der Wien to public acclamation. Its gently satirical plot echoed the state of affairs in the Viennese court at the time and in particular the plight of the malleable young Crown Prince Rudolf whose apparent combined murder-suicide, with his lover, Mary Vetsera, at the royal hunting lodge at Mayerling, was to shock the world nine years later (1889). Although The Queen's Lace Handkerchief has languished, its music is familiar to all Strauss lovers because it is enshrined in one of Strauss's most popular waltzes, Roses from the South. It is set well-away from Vienna - in Portugal. This rare but delightful, bubbly work centres on a fanciful adventure of the poet and author Cervantes - of Don Quixote fame. The youthful 19-year-old King of Portugal is kept away from affairs of state and his young 17-year-old Queen by the Regent, Count Villalobos, who is plotting a coup. In this he is aided his ridiculous henchman, Don Sancho. Instead, the young King is encouraged to enjoy himself in all manner of distractions, especially culinary, Cervantes, and his sweetheart Irene, First Lady to the Queen, collaborate to protect the interests of the naïve young Royals. However, Villalobos stirs up discord between the King and Queen - their marriage had not been consummated for the King had been distracted by food and drink on his wedding night. Through the sort of twists only operetta plots can conceive, the King showers attention on Irene who remains loyal to her Queen. The Queen, in turn, because she has been hurt by the King's lack of attention, conceives an affection for Cervantes who has been appointed the Queen's reader. The Queen gives Cervantes her lace handkerchief on which she has written, 'A queen loves you, though you are not a King.' Villalobos discovers it and uses the inscription to turn the King against his wife and Cervantes. After innumerable tribulations, all ends happily. Because of the relative youth of the King and Queen, Strauss gives both roles to female voices - almost in pantomime style which is not inappropriate to the frivolous nature of the plot. Thus we have a mezzo singing the King and two sopranos for the Queen and Donna Irene. The music is sprightly and effervescent. Its lovely melodies include the original vocal version of 'Roses from the South', one of Strauss's most beloved waltzes, sung first, beguilingly, in Act I by Nadja Steffanoff as the King. It is reprised several times in the course of the operetta including the enchanting Act II setting for Cervantes - a fervent Ralf Simon. There are other gems for the King including his lovely Act I Romanza with its plaintive violin solo, contrasted with his truffle song and his duet with Villalobos in praise of oysters. He is also given another lovely waltz song towards the end of the operetta, 'Siebzehn Jahre war ich eben'. As the Queen, Jessica Glatte, is plaintively, romantically expressive of her plight in her Act I Romanza, ''s war eine zaub 'risch wundervolle Nacht'. In the role of Donna Irene is Elke Kottmair, a lighter, lyric soprano voice completing the trio of the royal establishment. Her Act I duet with the King is another delight. There are numerous highlights. The second act has many jewels including the witty ensemble piece in which Cervantes outwits the devious Villalobos and Sancho: 'Professoren und Doktoren rief von Salamanca man' with its amusing woodwind comments. There's also the glorious second act Finale has more familiar music and makes for a scintillating seven minutes. Then in Act III there is Sancho - Markus Liske, in fine slapstick form - taking time off from his comic antics to serenade with his Zither song. The cast, directed by Ernst Theis, is youthful and their enthusiasm clearly evident. One hopes that CPO might release this live performance as a DVD thus giving non-German speaking audiences the opportunity to grasp the subtleties of the plot. Many tracks are dialogue only and in German. The album booklet does not include a libretto - we only have a synopsis and details about the history of the operetta. Judging by the cover illustration this Cologne production took a few liberties, setting part of the action on board a ship - the synopsis mentions no such location. 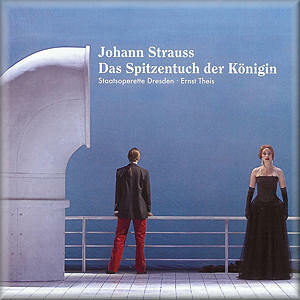 For Strauss enthusiasts, an album not to be missed. Scintillating.